Allergies may be one of the most annoying things on the planet. And they might even be more annoying when your dog has them. I mean, the constant licking and scratching is enough to drive even the most sane dog owner up the wall. So, finding the best food for dogs with allergies might be more of a quest for sanity than anything else. And we’re here to help. We talked to a few dog experts and did a bunch of research (and even some testing) to find out what exactly you need from a good hypoallergenic dog food. We’ve included some explanations in addition to some specific recommendations, so check it out, and let me know in the comments if you have any questions. 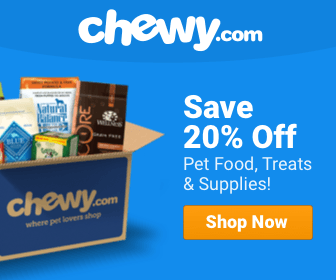 Is Food Really Causing My Dog’s Allergies? There’s a weird myth that goes around the dog world. People, for whatever reason, tend to believe that if a dog has allergies, it’s usually caused by food. But that’s not the case. In fact, Drs. Foster and Smith from PetEducation.com found that food allergies alone only account for about 20% of all itching and scratching in dogs. Food allergies plus atopy (the genetic predisposition to develop allergic diseases) account for another 20%. Altogether, some form/combination of food allergies accounts for less than half of itchy and scratchy episodes in dogs. To give you some perspective, fleas are a much more common cause of scratching. Of course, with this much grey area, you’ll have to just ask your vet—and probably run a few test (we don’t recommend diagnosing your dog yourself hardly ever—ok, never—anyway). What’s the Difference between Food Allergies and Food Intolerance? Food allergies and food intolerance are two very different things, but they’re confused pretty often. It’s important to know the difference, though, because you don’t want fork over a truckload of cash for a high-quality hypoallergenic dog diet if your dog’s not even allergic. Food allergies (or an allergy) occur when the body mistakes food for a harmful foreign substance. Most of the time, the body’s response to this sort of thing is to release histamines, which cause itchiness (a la poison ivy). Food intolerances are very different. Whereas a food allergy is an immune system malfunction, food intolerance is a digestive issue. For the most part, it just means that your puppy’s digestive system is having hard time digesting some part of their food. So how can you spot the difference? If you’re not sure whether your pup has a food allergy or food intolerance, you’ll want to look at her symptoms. Symptoms of food allergies include rashes, itching, scratching, biting paws, or lots of licking. Occasionally, food allergies cause vomiting and upset stomachs, although these symptoms aren’t as common. Food intolerance, on the other hand, creates tummy-related problems. These are the things any dog owner is familiar with: vomiting, gas, loose stools, bloating and loss of appetite. Of course, your vet will be able to tell you about your specific dog’s problems better than we can, so don’t be afraid to give their office a quick call. This video provides information about the dog breeds which are allergy prone. If you’re thinking about adopting a dog and need to learn more about various allergy prone dogs before making a decision, then you should definitely check it out. 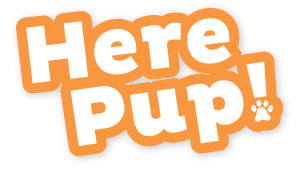 How Can Hypoallergenic Dog Foods Help? Hypoallergenic dog foods can help in a few different ways. First, most of these foods have very few ingredients (or at least less than most dog diets). This can help isolate the ingredients that are causing the problems. Many of these foods will say right on the label that they have limited ingredients. Just be sure to look and see if they actually do have limited ingredients and it’s not just some marketing ploy. Second, dog foods formulated for dogs with allergies typically include out-of-the-ordinary ingredients. In other words, they’re not going to be chicken + a bunch of other stuff. They’re going to include interesting, more obscure ingredients, like buffalo, pheasant or kangaroo (really!). 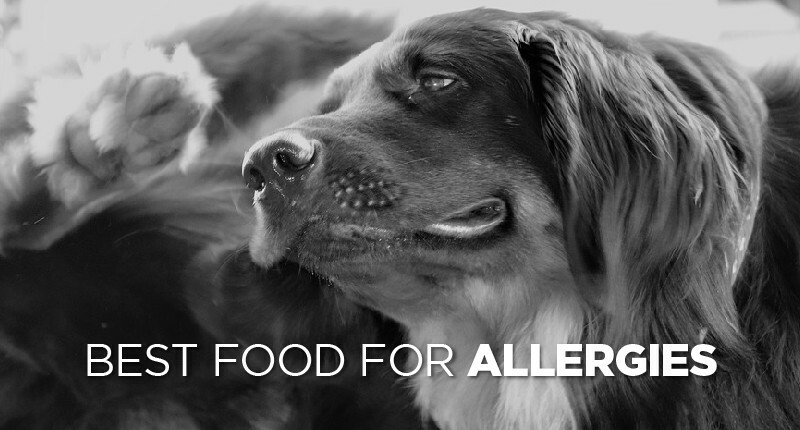 Lastly, hypoallergenic dog foods will avoid common allergens—stuff we know tends to cause allergic reactions. According to Drs. Foster and Smith, common allergens include: beef, dairy, chicken, fish, corn, wheat, soy, and yeast. 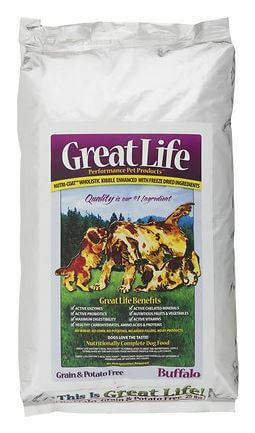 We honestly hadn’t tried much of Great Life’s dog food before sitting down to write this article, but after getting a sample, doing some heavy research, and getting lots of recommendations from other dog experts, this easily rose to the top our list. 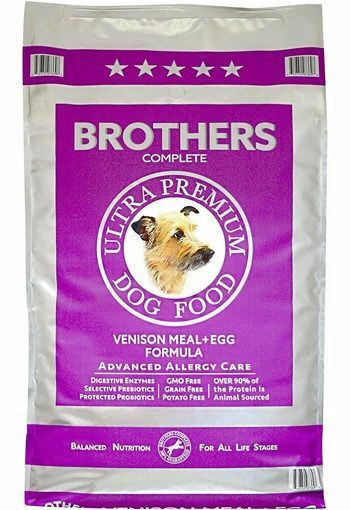 This is just a good formula all around, and it does exactly what we want a hypoallergenic dog food to do. First, it has limited ingredients. None of the common allergens listed above made it into this food. There are also relatively few ingredients, and the main sources of meat come from “novel” ingredients, like buffalo and bok choy. There are also lost of good veggies here: kale sprouts, clover spouts, yams and zucchini. You’ll also be able to find some blueberries. All in all, this is a good dog food, and it should help you avoid—or at least nail down—your dog’s allergies. This is another good hypoallergenic dog food with limited ingredients that are just weird enough to be super helpful. For example, the protein here comes mostly from venison meal, although you’ll find some whole eggs and turkey meal as well (turkey is not a common allergen, according to Drs. Foster and Smith. This didn’t top our list mostly because there’s not a good, identifiable source of complex carbohydates. However, there are a few root vegetables, which are almost as good—namely carrots and pumpkin. We also wish there were a few more fruits and vegetables. Other than that, though, this is a good recipe, and it could certainly help stop the itching. *Note: The venison formula seems to be sold out, so we're linking to the lamb formula. 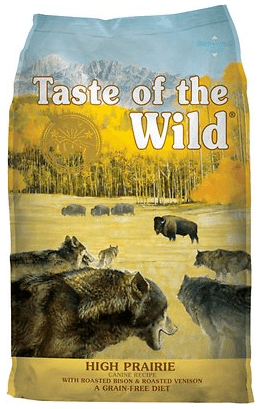 If you’re looking for a brand, Taste of the Wild is a fairly safe bet. They’re well known for their high-quality ingredients and novelty meats. In this particular formula, the main ingredients are bison and venison, which a good, out-of-the-ordinary meats. However, we do want to mention that this food contains a few other types of meat that could potentially be allergens: lamb meal, chicken meal and fish meal. So if you have absolutely no idea what is causing your dog’s food allergy, you may want to go with something a little safer. But if you suspect it’s dairy or something, this food is probably fine. Plus, there’s a decent amount of produce here (although not a ton), including blueberries, raspberries and tomatoes. 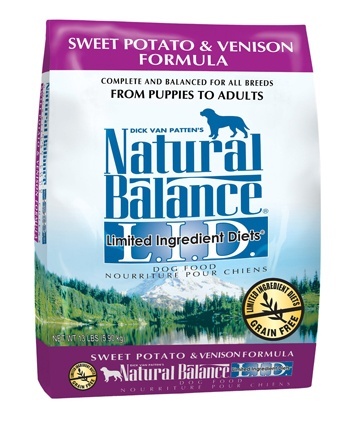 We like Natural Balance Limited Ingredient Diets Sweet Potato and Venison Formula mostly because it’s very, very simple. Really, there are very few ingredients here. And that kind of hurts it, too, since they’ve almost totally skipped the fruits and veggies, which is something we like to see in the best dog food for allergies—no matter what it’s for. Still, it’s a simple food with high-quality ingredients and a very simple nutritional profile. The main reason we listed it last is that it breaks one of our golden rules: protein should always be the first ingredient in any food for dogs. Here, it’s potatoes. The protein (venison) is the second ingredient. Tsk tsk. For that reason, we do not recommend using this as a forever-food. Like this article? Here's another good one on low fat dog foods, and here's one on dog food for tummy troubles. We also have a good article about dental chews here. Or, if you're deciding between wet and dry dog food, check out this guide. We've also got an article on puppy food and one on doggy weight loss. And here's our epic post on dog food. That said, it can certainly be useful if you’re trying to figure out what your pup’s allergic to.